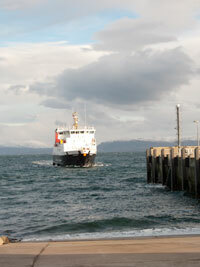 The Cal Mac Steamer MV Loch Nevis arriving at the Pier on Eigg. With ScotRail from Edinburgh and Glasgow on the West Highland Line, which has been voted the Top Railway Journey in the World. Stagecoach run a service from Glasgow through Citylink to Fort William. Highway regulations do not permit Visitors' cars on the island unless you are disabled. So if you do choose to drive, cars must be left in Mallaig or Arisaig. There are plenty of parking spaces at Mallaig and Arisaig. Eigg has a good taxi service. 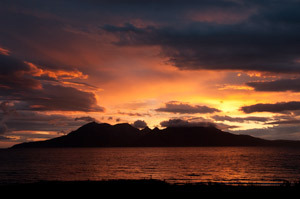 Sail from Mallaig direct to Eigg, with a journey time of 1 hour 15 minutes. There are plenty of car parking spaces at Mallaig around the harbour. The summer timetable runs from March 'til October. There are excellent buffet facilities onboard the boat, and there is a disability lift on board. 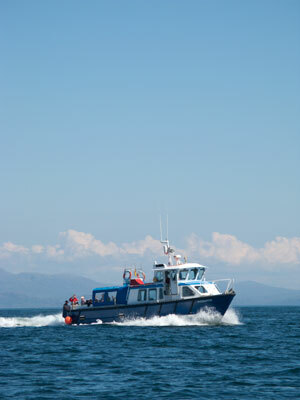 There are direct sailing to Eigg on Mondays, Thursdays and Saturday afternoons. If you would like to see some of the other islands en route to Eigg, Tuesday, Friday and Saturday morning boats visit the other islands. For full details of the sailings timetable click on the blue link (summer timetable) above. Tickets For M.V. Sheerwater are purchased from the newly built Harbour Office, which also houses a small Tea Room & Gift Shop. The Tea Room provides high quality Fairtrade Organic Coffees, Hot Chocolate & Speciality Teas. There is a good selection of Home Baking and tubs of delicious Organic Ice Cream & Smoothies. The Gift Shop offers a wide range of unusual Gifts, Jewellery, Soaps & Cards. You can also purchase local Walking Guides, Maps & Fishing Equipment. The trip on The Sheerwater takes approximately 1 hour. It is quite usual to see Minke Whales, Porpoises, Common and Gray Seals, Basking Sharks, and Dolphins on the journey. You will also see a great variety of Seabirds, including Gannets, Puffins, Guillemots, Razorbills and rafts of Manx Shearwaters. There is parking available at the Arisaig Marina.